Mornings are beautiful, but a lot of people like to sleep in and don't see them. We have put together a bouquet that will let even the latest sleeper see what morning has to offer. 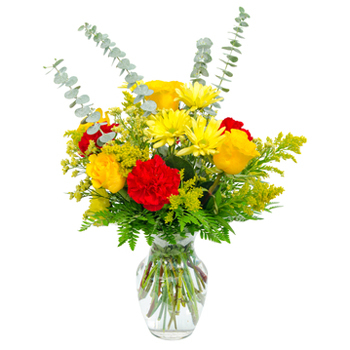 Your recipient will receive yellow Roses, vibrant red Carnations, and yellow spray Chrysanthemum along with greenery. Say I Love You, decorate your room, or send a smile with Sunrise.